Inside the Whittier Manor Senior Apartments, everything glistens. The stately Detroit building complex, a former apartment hotel built to architect Charles N. Agree's Neoclassical and Italian Renaissance Revival designs in the 1920s, partially reopened as a living center for adults 55 years and up in 2008. A participant at the Salvation Army's monthly senior luncheon dons a festive hat. Located on Burns Drive near East Jefferson Avenue and the Detroit River, Whittier Manor features 120 remodeled luxury apartments, arranged in nine different floor plans, as well as a fitness center, and gated access for residents. Listed on the National Register of Historic Places, the Whittier hotel once served celebrity guests like Mae West, Frank Sinatra, and the Rolling Stones, but fell on hard times and ended up shuttering its doors in 2001. Detroit developer Melvin Washington of Phoenix Group Companies purchased the complex in 2003, and has been redeveloping it in phases since then. Washington is being proven right. The area around the Whittier, especially the nearby Jefferson Chalmer's neighborhood, has been experiencing an exciting resurgence. Vacant structures like the IDAO building are being converted into housing units and new restaurants like Norma G's, a Caribbean eatery, are setting up shop there. How seniors figure into this unfolding neighborhood development situation is a top concern for city planners. Jefferson Chalmers is community that's been trending older in recent years. Residents 60 years and older made up 20 percent of the neighborhood's population in 2010, compared to just 13 percent in 2000, according to a 2012 Michigan Community Resources report based on U.S. Census data. In addition to glittering Whittier Manor, there are three other large housing complexes providing assisted living to seniors in and around Jefferson Chalmers, not to mention a large number of older adults who live independently in their own homes. "Because there are a lot of seniors in the neighborhood, many of whom are aging in place, this really motivates the city to have a focus on retail," says Allen Penniman, an urban planner for the City of Detroit Planning Department. Penniman has been one of the leads on the Jefferson Chalmers Framework Plan, which is guiding development in the area. "It's important for seniors to be comfortable and safe," he says. "To be able to walk or scooter around without having to leave the neighborhood for basic needs like groceries and medications." The City of Detroit is now putting out a request for proposals for a mixed-use complex that would include a new grocery store. But, retail is not the only need. Supporting the needs of seniors who are still living in their own homes is also a priority in Jefferson Chalmers. The city offers a zero percent home repair loan and supports a program called Rebuilding Together through which seniors can apply for home repair services. Jefferson East, Inc. also supports seniors through foreclosure prevention, safety awareness, and home repair programs. Two of the more popular programs serving Jefferson Chalmers' senior population take place at the Conner Creek Salvation Army building located just outside the neighborhood's boundaries at 3000 Conner Street. The first of these is a weekly senior computer lab that educates older adults about using their phones, laptops, and tablets. One of the most popular requests the lab gets is helping senior set up Facebook pages. The Salvation Army building also hosts a hugely successful monthly senior luncheon. Although the theme varies each month, the event is always packed. In fact, Captain Kelsie Moreno of the Salvation Army believes that even if it was held weekly, the event would still get the same response. The Salvation Army's monthly luncheon offers older adults in the Jefferson Chalmers area a chances to mingle. "Fellowship is really important for seniors, especially those who are aging in place in their own homes," says Captain Moreno. "The elderly are often lonely. They may not have anyone else living with them or know their neighbors. This gives them a chance to get out and meet with other people." Each senior luncheon features a theme and a speaker. Past luncheons have included representatives from organizations like the University of Michigan Alzheimer's Center, Legal Aid who've covered topics that include elder abuse and identity theft. 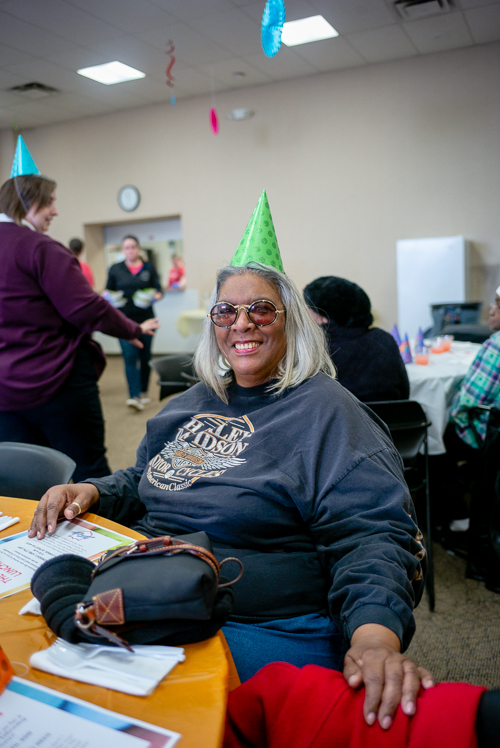 Frances Sinclair, a local resident, attended the March senior luncheon, which had the theme "Everybody's Birthday." "The lunch shows us the appreciation of the program to the seniors," she says. "They give us a place to go were we feel appreciated by the staff, the community, and the Quicken Loans volunteers." Keen to support those who have supported her, Ms. Sinclair also donates to different Salvation Army programs. Another space dedicated to assisting local seniors called the Northeast Guidance Center is located right next door to the Salvation Army building. Focused more on the physiological and psychological well being of older adults, it provides medication management support, as well as services like hospital liaisons, and mental health services for the elderly. There is also a pharmacy at the facility. Both Hope Community Church and the Manistique Community Treehouse Project also provide assistance to seniors, with the church sponsoring a volunteer program that provides simple home repairs and the treehouse offering therapeutic services. But there is always a need for more. "I would say awareness is important. Seniors are some of the more forgotten and underserved people in our communities, and that's sad," she says. "The seniors in our neighborhood have been here this whole time, and they deserve the very best that we can offer them." 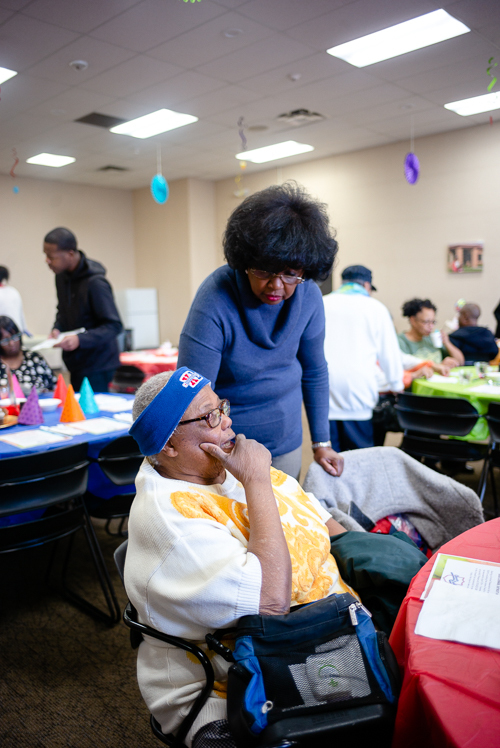 If you are a senior or have an elderly loved one living in Jefferson Chalmers (or elsewhere in the city of Detroit) in need of community services, please reach out to the programs included in this article or contact the Detroit Area Agency on Aging at 313-446-4444. All photos by Stephen Koss.